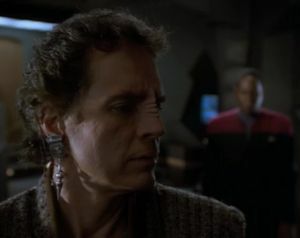 Major Kira rescues a famous Bajoran resistance leader from Cardassian custody, but the man may not live up to the grandiose legends that surround him. Sisko seems really energetic and cheerful--almost manic--at the start of this episode. Either Avery Brooks is overcompensating for his overly sedate acting in the first season, or the writers are forcing him to liven up a little. Jake is a normal kid, which is much less annoying than Wesley's super-smart "special" character in TNG. The introduction of The Circle--and their slogan "Bajor for Bajorans"--promises a plot thread that would be really hard to get rid of. It's also a logical extension of the political tensions seen in "In the Hands of the Prophets." Sisko is seen playing with the baseball given to him by the fake Buck Bokai in "If Wishes Were Horses." It's cool that it's harder to keep a secret on Deep Space Nine, which is a logical reflection of the slightly less professional attitude of the crew. Good location shoot for Cardassia Four. It's much better than the usual Star Trek outdoor sets. Frank Langella?! Awesome. DS9 keeps acquiring some first class guest stars. Those guys in the masks who attack Quark are suitably creepy-looking. Usually, you can tell when an episode is heading towards a cliffhanger ending, but this cliffhanger seems to come out of left field as the major plot problem of Li Nalas is wrapped up by his return to Bajor and his begrudging acceptance of his own legend. Granted, the subplot involving The Circle is still dangling, but it almost feels like the kind of plot that could just slowly recur throughout the season. This episode is clearly inspired by The Man Who Shot Liberty Valance, and Sisko comes really close to quoting the famous line, "When the legend becomes fact, print the legend," during his climactic talk with Li Nalas. As a stand-alone episode, it's good drama, but a little too derivative to stand out. I like that it uses Jake to comment on how big political issues can create racial tensions between individuals who are completely innocent and undeserving of them (which is always more obvious when the person facing discrimination is black). So even though the cliffhanger took me by surprise, I'm glad the story is set to continue, because it could go in many interesting directions from here.